Many arrive in Galicia via de airport in Santiago de Compostela. And once here, you probably would like to see the cathedral and what Santiago has to offer. That said, Galicia is a lot more than Santiago de Compostela. One city that is well worth a visit is Lugo. 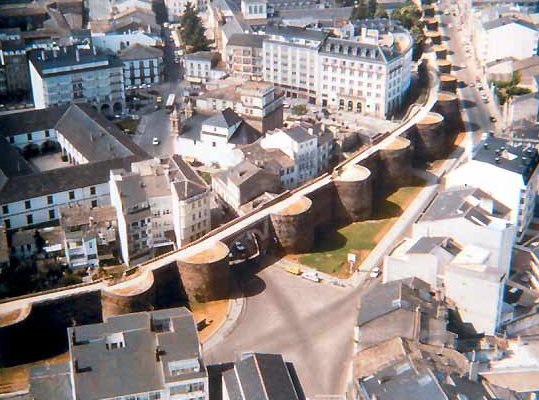 The thing that you will notice once you arrive in Lugo is the roman wall that surrounds the old city. It is the only roman wall that is still intact today, and is great way to get to know the city. Since the wall goes all around the city, walking one lap you will see the whole city from above, and get some exercise as well. Lugo also has Roman thermal baths and a great cathedral, in addition to a quiet and calm old town. If you are traveling from Santiago to Lugo, the best and easiest way to get there is by bus. Visit the Alsa website and you will see that there are several busses each day. The travel time is about 2 hours and 15 minutes. The bus station in Lugo, where the busses arrive, is located about 50 meters from the roman wall and the old part of town. You can find out more about Lugo at the Lugo Tourism website.